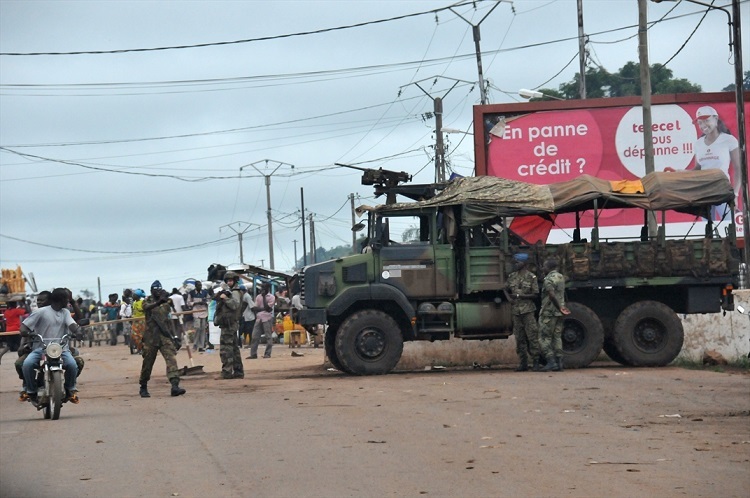 A local MP has accused UN peacekeepers in the Central African Republic (MINUSCA) of “complicity” in an attack which claimed dozens of lives, including ten Red Cross workers, in the eastern town of Gambo recently, World Watch Monitor has learned. The MP for Gambo, Michel Kpingo, in a statement (7 August) said that while all had wished for the UN Moroccan contingent to be replaced, it had not been, and that “the complicity of these soldiers was clearly established in the events of Gambo”. Yesterday (23 August), the UN’s outgoing humanitarian chief, Stephen O’Brien, warned the UN Security Council that there are “early warning signs of genocide” in the Central African Republic (CAR), with “a terrible development of militias now using ethnic or religious” reasons for attacks. 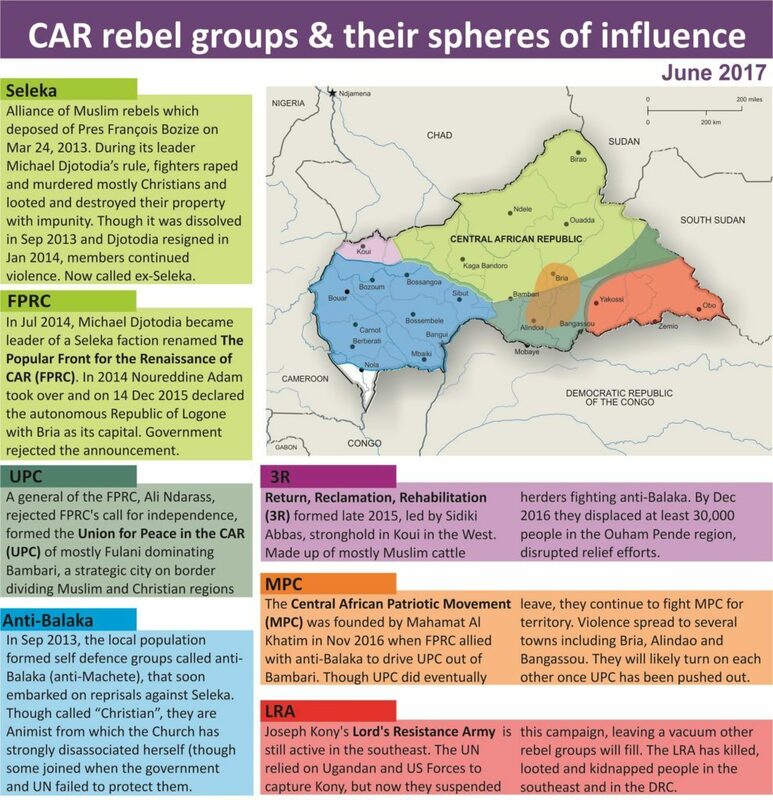 The Gambo attack was carried out on 5-6 August by ex-Séléka rebels, now part of the UPC – a mainly Muslim and Fulani militia, and one of 13 armed groups who signed a peace agreement two months ago. Dozens, maybe even hundreds, of civilians who sought refuge at the Gambo hospital were slaughtered; most of the victims were women and children and many patients had their throats slit; others were burnt alive in their properties. An undetermined number of houses and properties were also looted and burned down. The Moroccan UN troops, who stayed in the town for two days during the violence, did nothing to prevent the killings or protect civilians, several local sources told World Watch Monitor. A heavily armed UN convoy arrived around 1pm on 5 August and stayed at the Catholic compound. Its arrival first provoked panic among Gambo residents; many ran towards its hospital and the Catholic church. Described in Western media as 'Christian rebels', the Anti-balaka are anything but Christian; at best they might be nominal or cultural Christians. Wearing juju (occult charms) around their necks, they fight with knives, clubs, rifles and (ironically) machetes, to rid the south of Muslims. Furthermore, they routinely threaten to burn churches and kill pastors that shelter Muslims. But as the Rev. Dieu-Seni Bikowo explained in 2014, "For us they are not Muslims or Christians. They are people - people in danger." Only two days before, (3 August), self-defence militias (Anti-balaka), composed of local youths, had attacked and chased from Gambo UPC militias, whom they accused of many atrocities against civilians during the UPC occupation of Gambo since 2013. Some Red Cross workers at the hospital (about 500m from the Catholic compound) went to try to find out what was going on. But the UN commander told them there was nothing to fear, as the convoy was just passing. However, at about 2pm, UPC fighters emerged from various directions and started killing people. World Watch Monitor has learned that most UN troops wore Moroccan uniforms; a few more were believed to be from Egypt and Bangladesh. Also on their convoy were some civilians, believed to have been Muslim IDPs who had been sheltered in Bangassou Cathedral. An eyewitness told World Watch Monitor that he recognised one of them as an ex-MSF worker in Bangassou. He said he saw him firing at Gambo civilians. Many people ran towards the Catholic compound and the hospital. But the UN troops, too, are said to have fired into the air to prevent them from entering the compound. MINUSCA has denied the Kpingo’s allegations, calling them “untruthful”. Those who sought refuge at the hospital were hacked down by the militants. Men, women and children were chased and massacred with arrows, machetes and guns. 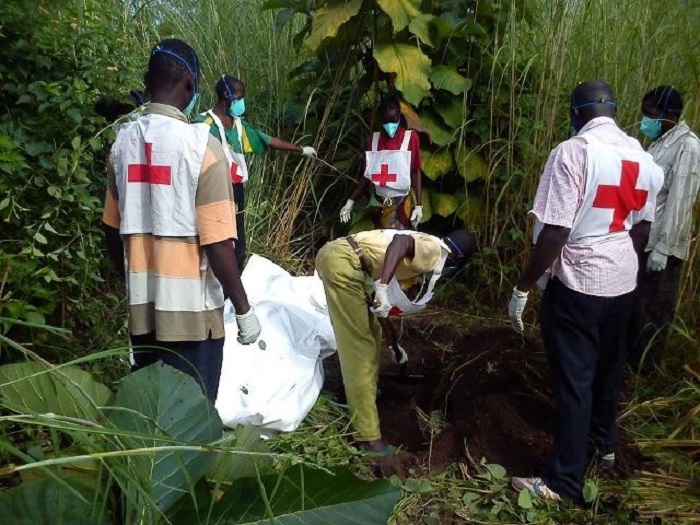 Ten Red Cross workers were among those killed. Bogo emphasised that the Red Cross is not engaged in the CAR conflict, due to its principles of neutrality. World Watch Monitor has obtained a list of the ten victims; all were Christians. One was a Baptist pastor, Joseph Tokon of a church in Mabo, 30km from Gambo. In his fifties, Tokon left a wife and seven children. One eyewitness told World Watch Monitor a Red Cross banner at the hospital entrance was removed by UPC militiamen before they attacked and killed the Red Cross workers and other civilians. Another eyewitness said UN Moroccan troops entered the hospital at about 7pm, and opened fire on survivors of the first UPC attack. The Bishop of Gambo, Father Augustin, told World Watch Monitor the Moroccan troops also looted and ransacked his compound. “They broke the doors and desecrated the church. My clothing and other material used for services were thrown on the floor,” he said. The convoy left the compound on Sunday 6 August at about 9am and headed towards Pombolo (about 40km away), believed to be a UPC rebel base. The violence and destruction continued after the departure of the UN troops. UPC militants looted and burned down a number of properties, according to witnesses, who described a scene of devastation, with bodies littering the streets and others thrown into wells, raising fears of cholera. Most of the 5,800 inhabitants fled into the bush or to Bangassou (75km away). Some of the injured were taken to Bangassou by volunteers on motorbikes. The ex-Séléka and UPC leader, Ali Darras, has denied any responsibility for the massacre. Kpingo reiterated his accusations to World Watch Monitor and called on the authorities in CAR to take responsibility for protecting civilians. Allegations of a lack of impartiality from UN peacekeepers in CAR are not new, with the Moroccan contingent in Bangassou previously accused of indiscriminate killing of civilians, prompting the Bishop of Bangassou, Juan José Aguirre Muños, to demand their withdrawal. His demand has been seconded by the President of the Islamic Council in the CAR, one of the country’s top three religious leaders and a founder member of its Interfaith Platform. “The people are witnesses and victims of the activity in [Bangassou] of the Moroccan contingent of UN peacekeepers,” said Imam Oumar Kobine Layama, part of a delegation sent from Bangui to investigate the situation in and around Bangassou. “The people want the contingent to leave Bangassou because it has failed in its duty to protect civilians. These troops do little or nothing when the militiamen attack. Some say the Moroccan military are the cause of several cases of murder because they shoot civilians point-blank, calling them militia,” he added. Bangassou and its surroundings have also been the scene of clashes between ex-Séléka rebels and Anti-balaka militias. For months now, Bangassou Cathedral has sheltered some 2,000 Muslim citizens threatened by the Anti-balaka militias. The Central African Republic currently has around 12,000 UN peacekeepers. Nine from the Moroccan contingent have lost their lives in clashes with self-defence militias this year.